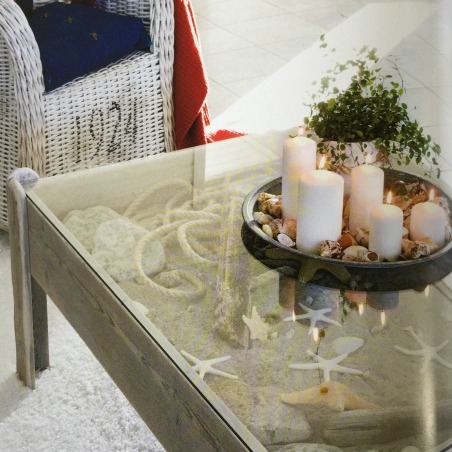 The driftwood toned table with glass top holds a treasure trove of beach combing finds, filled with sand, shells, and starfish. Now wouldn’t that be a great conversation piece! She gives full instructions on how to make it yourself. 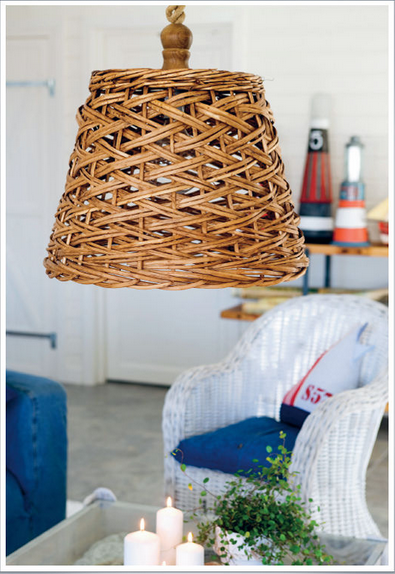 Learn how to creatively repurpose and transform baskets into lamps. We all have a pair of denim jeans which we love, right? 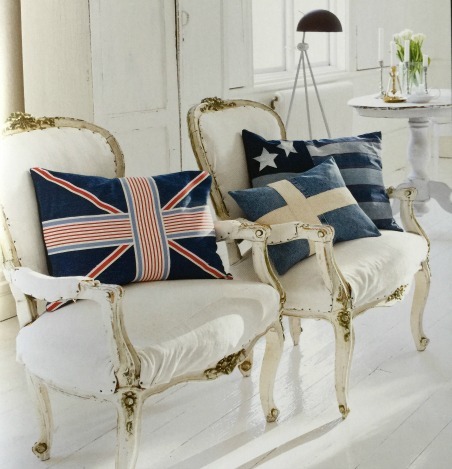 How about taking the relaxed comfort of denim and changing those jeans into nautical flag pillows? This book is filled with tons crafty tutorials and different ways to decorate with rope! You’ll find projects using rope on mirrors, window treatments, lamps, tables, light fixtures, etc. 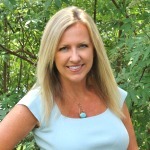 Anna also helps to give her advice on choosing a sea inspired color palette for your home whether you desire a more coastal, tropical, or nautical look. 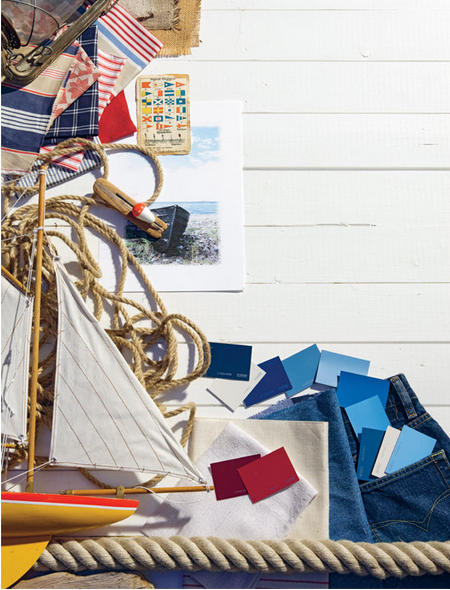 The Nautical Home will walk you through all the seasons with decorating inspiration, helping your home feel like the seaside escape you’ve always wanted. Doesn’t this book sounds wonderful? It would make a great gift too! CLICK HERE now to order your copy from Amazon (affliate link). Today I have a special treat for Sand & Sisal readers! I am giving away 2 hardcover copies of The Nautical Home! Simply click and enter for a chance to win the Rafflecopter form below! Best of luck! Looks like a great book. Thank you for the opportunity! I love to add shells, surfboards & coastal decorating books. I use lots of blues & whites in my home. I add lots of driftwood pieces, sea glass, lanterns and lighthouses to get my beach theme flowing. My color scheme is a sea glass pallet, light greens, blues and white. I love to add anything galvanized and rope. 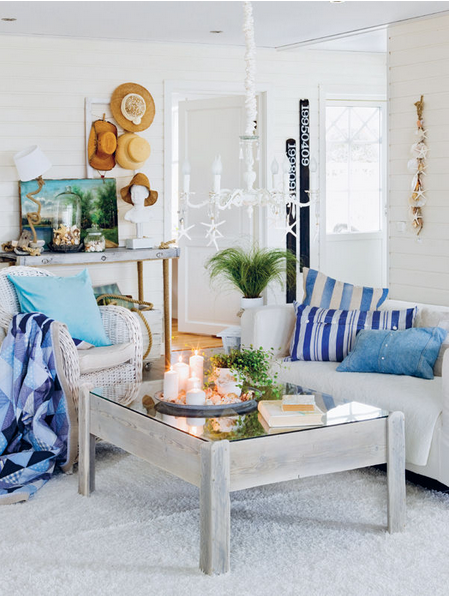 Lanterns, seashells, rattan, and distressed coastal-themed furniture make things really comfy for me. 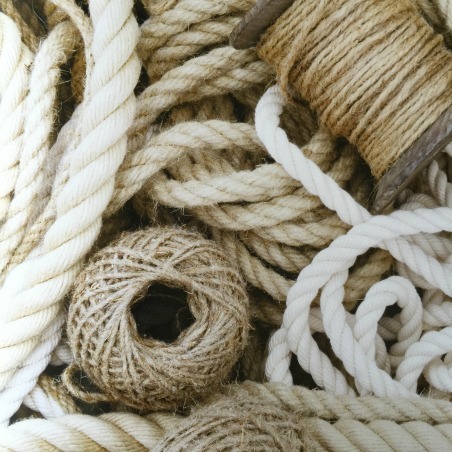 I love rope… Any kind/ color incorporated into my DIY. Twine is probably my favorite there are so many things to do with it! I love the soft coastal paint colors! I love adding items that are in seaglass colors and seashells. Love all of the great ideas you shared from the book, would love to win it. I like the calm cool colors of the sea. Seashells, anchors,sand, and just about anything to do with the beach. I love to decorate with soft grays the color of driftwood and beiges the color of sand. This book looks amazing and timing couldn’t be better. We just moved and I am starting over with my nautical/tropical designs. I have lots of rope to add special touches and lots of memorabilia from our 11 years cruising the tropical waters of Mexico on our sailboat. We may be landlocked now, but we haven’t forgotten the feeling of sleeping in a gently rocking sailboat and all the joys that go with it. i’ve been redoing our whole house with coastal feel – light grey and blue walls, lots of texture and woven baskets. my favorite is a canvas i took and put one shell from each beach and the date we’ve been to, a little time capsule of all of our favorite spots! I love to use shells. To me they are the best example of nature’s art. I love them in old boxes, baskets, tarnished silver plates, etc. This books looks great, thanks for the chance to win! I may live in the Midwest, but my house looks like I’m back in New England! Since moving to Florida I have decorated our new home in the coastal style. I love using blues and white and lots of seashells in our home. Love the watery blues and greens of sea glass mixed with lots of white! I hope to win a copy of this book. We just bought a house and I want to incorporate the nautical/ beachy feel to all of the rooms…without it being to overwhelming. I have no idea where to start. I love the soothing, calming colors. Makes me feel like I slowly rocking on the waves! I just purchased a large ceramic sea anemone bowl/candle holder. I can’t wait to use it. I am also redecorating our bedroom using blues and whites, bamboo shades and sea grass wallpaper. I have soft blue, sandy beige, and pearlescent shells that adorn my coffee tables. Above the fireplace is a large picture of the ocean that you just get lost in. I love ocean blue and coral together. My friend and I put coral covers on my dining room chair cushions. They turned out great! I’ve always liked the coastal style. When we moved to Florida 12 yrs ago, I new with out a doubt that I would style my new home this way. I’ve chosen a lot of Tommy Bahama furniture with lots of coastal accents. I would love to win this book. Thanks for the giveaway! I love anything with board and batten, beadboard and shiplap! I’ve installed the first two in my house but someday would love shiplap in a house by the sea! Love to use sea shells and sisal in my decorating. I use colors in soft Aqua, cream and driftwood gray. I love starfish and bamboo – both are great to use in decorating. I enjoy adding art work with either a nautical theme or color scheme to add a “beachiness” to my home. I particularly like the art of Kathy Buschy, a local artist from the Rehoboth and Lewes, DE area. I also use starfish and shells. I have recently moved to Naples, FL and I really NEED this book. THX!!! I have followed your blog for a long time and enjoy your pictures and instructions. I live near the coast in Washington and have been using the ocean colors in my new home, but sometimes get stopped by not knowing where to go from where I am. I would love this book to refer to when I get stuck. Love the photos you posted from the book. Fingers crossed that I will be lucky enough to receive one. Thanks! My sister has a summer home and I would love to present her with Anna’s book chocked full of decorating ideas! This looks like a very informative and beautiful book. Having just moved into a coastal style home and being summer time sailors on Lake Erie, I know I will be searching for ideas like those in this book to begin to decorate our new place. I have my eye on a beautiful model sailboat and know just where to use it! I love to add watercolor paintings and using blues throughout the house. Thanks for the chance to win! I’m working on decorating my house in a nautical style. This book looks like a great reference. This book looks fabulous!! I was just looking at it on Amazon and then saw your give away! I’ve got my fingers crossed to win! There is nothing more classic and inspiring then room decor done with a nautical inspiration. Thank you for the opportunity to be a constentant . I love the beachy look! I have lots of turquoise and white all over the house. I also have lots of seashells from our trips to the beach. This book looks wonderful! Thanks for the raffle! 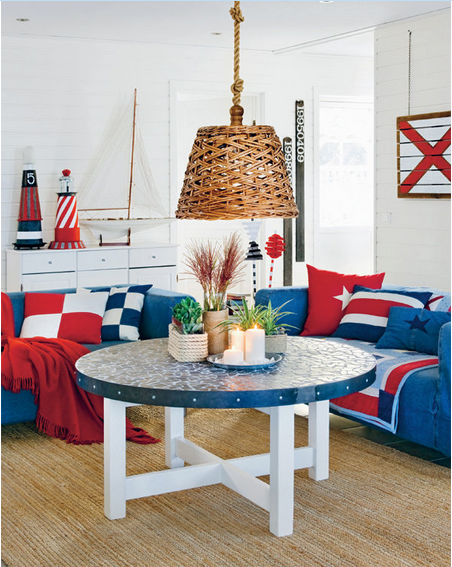 Personally, a nautical theme is one of my favorites! I especially love having shells displayed in many rooms in my home. 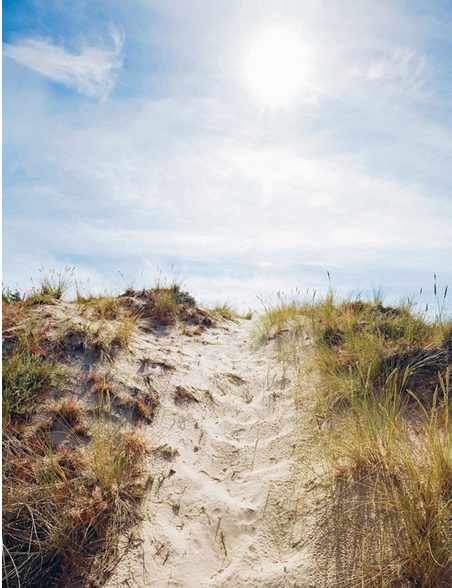 I live on a barrier island and so it is natural for me to use nautical elements in our home. My favorites include blue canning jars, Denton fish prints, nautical pillows, and of course shells and drift wood. This book would make a great addition to my coffee table. This looks really helpful. I love color, but get stuck when the time for decision comes. I really need guidance on color selection! I already subscribe to your blog. I love decorating with shells and sand, blue glass bottles of various kinds, books on decorating with shells and fish and have two of the cutest beach maids, sitting on beach balls, reminiscent of the 20s and 30s that fit right in. You posted this on my birthday; it would make a great birthday present! Wow this looks like a book I would cherish and refer to time and time again. My daughter decorated her house in nautical decor, collecting lighthouses, adirondack chairs, beach things, etc. and then lost her house and everything in it in a big fire a couple years ago. She is starting another collection and trying to restore the look. I would love to give her the book for Christmas and I know she would love it. Thanks for the opportunity. I live on Crete, Greece and I collect sea shells and rocks from all the beautiful beaches we visit. I also have beachy style furniture and décor. 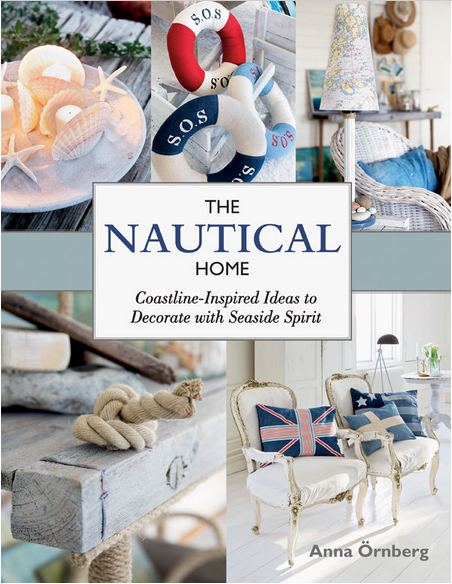 I am trying to add nautical decor to my house and love they way she incorporates it in this book without being overdone. Living in FL with a Coastie in the family, how can I not be drawn to anything nautical?! Love the natural colors of rope and shells. And they go anywhere with anything! I love the look of sea shells and starfish and use them in our home. This book will be great for getting new ideas of how to update the home. I love anything Nautical! I make jewelry using tiny nautical knots, with sea inspired charms and colors. I’ve live on a boat, sail the South Pacific! 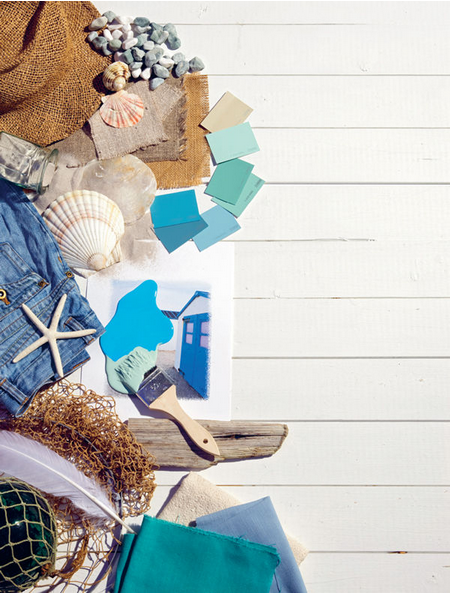 Now I’m decorating my house with a Nautical, Beach cottage theme! Love this book for the ideas to incorporate in my decor! I like using colors and accessories that remind me of the beach. The book looks wonderful. Thanks for the chance! Natural seaside colors…sand and aqua. Seashell collections. This book looks like it has tons of ideas and inspirations. Now, if I can just get to a beach. So excited! I emailed you my address! Thanks again for hosting this giveaway, Kim! Thrilled to have been one of the lucky winners! I enjoy all your decorating ideas…you’re an inspiration to me…all of us! Thank you so much Olivia and congrats!